No way! Sure, 18 years ago Chimay was an exotic wonder for the curious beer fan. Complex spicy, funky flavors, stuff floating around the bottom of the bottle…and, 9% alcohol. Even the 25oz corked bottle was a curiosity. Would drink these down where they could be found back then (Copa Too and Elephant and Castle in the city, Thomas’s in Manayunk), matching branded goblets a treat. Now a days there are plenty of funky corked Belgian styles to be found – from great local breweries like Sly Fox, Flying Fish, Victory, Weyerbacher and others from many domestic brewers – from the fine Allagash brews of Maine to North Coast in California, just to name a couple. Imports from Belgium now number in the dozens, find them at the Beer Yard, Teresas Next Door, TJ’s, Monks, Eulogy, Zot, etc. Does this mean that Chimay has lost it’s place in the beer hall of fame? Well, I say emphatically not. A great beer with food, particularly the rich Grande Reserve, still a spicy delicious brew-experience, even for the true beer snob (you know who you are). Had one a lunch today at Bourbon Blue in Manyunk, was truly satisfied. 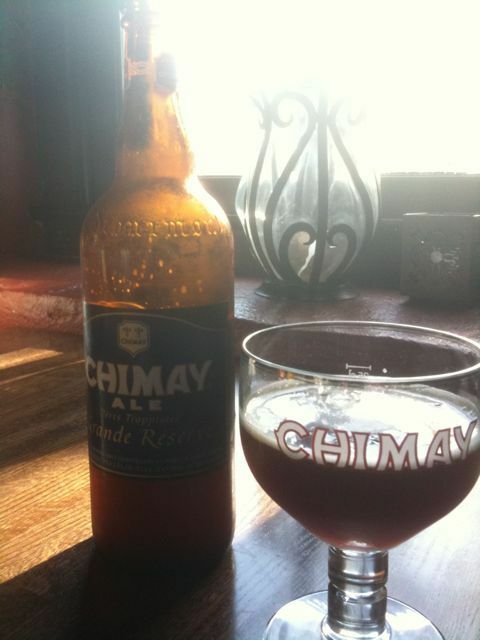 So, let’s not forget our old venerable friend Chimay, one of the brands that started it all…Try one again soon. TJU 10/28 Phils or Beer? Both!